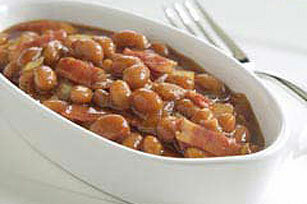 Get the flavor you want without heating up the oven by making No-Bake BBQ Beans. No-Bake BBQ Beans are rich in flavor and super simple to prepare. Cook bacon in large saucepan until done, stirring occasionally. Add onions; cook and stir until crisp-tender. Stir in remaining ingredients. Bring to boil; simmer on medium-low heat 15 min., stirring occasionally. Prepare using KRAFT Thick & Spicy Barbecue Sauce. Prepare using OSCAR MAYER Center Cut Bacon.